Recent findings from a 20 year medical study in Europe discovered that using Traditional sauna at 174*F or hotter, 4-7 days a week and 20-30 minutes at a time can lower your risk of Dementia or Alzheimer’s Disease by as much as 66%, lower your risk of death by Cardiovascular Disease as much as 50% and lower your risk of ALL diseases by as much as 40%! 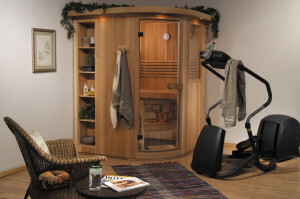 Please take note that the optimum temperature of Far-Infrared sauna to the human body for maximum penetration is 128*F to 132*F which is a more gentle heat for sauna users that suffer from Fibromyalgia or Arthritis related conditions that can’t tolerate the higher temperatures of Traditional sauna. If Far-Infrared saunas suit your needs, Helo does have the worlds safest and most effective units available! Dr. Ronda Patrick and Dr. Jari Laukkanen on TRADITIONAL Sauna Use for the Prevention of Cardiovascular & Alzheimer’s Disease! This podcast features Jari Laukkanen, M.D., Ph.D., a cardiologist and scientist at the Institute of Public Health and Clinical Nutrition, University of Eastern Finland, Kuopio. Dr. Laukkanen has been conducting long-term trials looking at the health effects of TRADITIONAL sauna use in a population of over 2,000 middle-aged men in Finland. The results? Massive reductions in mortality and memory disease in a dose-response fashion at 20-year follow-up! How Sauna Use May Boost Longevity! We also have had clients purchase our saunas as prescribed to them by their Doctors for Cancer Treatment and Fibromyalgia! Sauna and steam do more than just make you feel good! Hyperthermic Conditioning for Hypertrophy, Endurance, and Neurogenesis! Dr. Mercola and Rhonda Patrick Discuss Extreme Temperature Benefits! Please keep in mind, Dr. Rhonda Patrick and Dr. Mercola that aren’t endorsed or sponsored by any sauna companies or manufacturers. They just give you the raw data of what is healthiest to the human body. Top 10 Health Benefits of Sauna! It is always recommended to consult a doctor before using sauna.